Successfully Added Bluetooth Rearview Mirror with Built-in GPS Navigation (5 Inch HD Touchscreen) to your Shopping Cart. 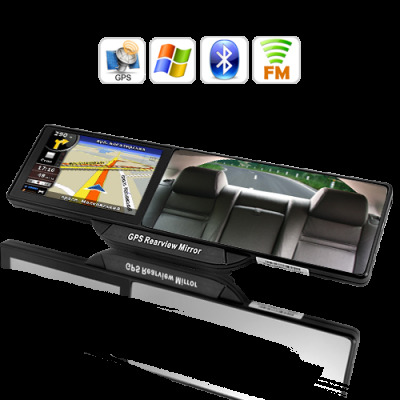 Replace your normal rearview mirror with this all-in-one Bluetooth Rearview Mirror for hands-free cell phone calling, built-in GPS navigation, and beautiful multimedia on-the-go! Also featuring an eye-pleasing 5 inch HD touchscreen, this high-tech rearview monitor is one of the safest and smartest car gadgets available. Entertainment while you wait: Stuck in traffic, waiting to pick up your kid from school, or just plain bored in the car? Well this handy Rearview Mirror has something for everyone and includes high resolution video playback, speakers for music playback, and plenty of entertaining touchscreen games! Best of all, everything is available on a crystal clear 5 inch HD touchscreen.